Please refer to our stock # 1-1138 when inquiring. 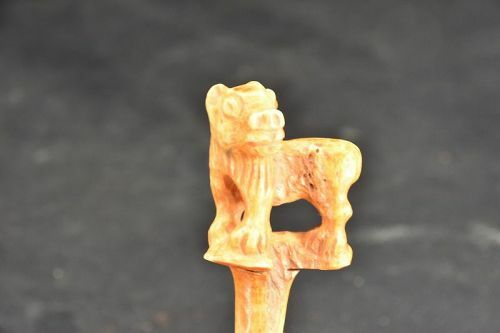 Hair pin carved in the shape of a lion standing on a rounded base, surmounting the short pin. Bone with reddish color. Bactria, ca. 400 B.C. Height: 11.3 cm. Slight damage due to age, otherwise very good condition. Large Bronze Ring, Bactria, Ca. 400 B.C. Rare 14 K Gold Pendant # 1, Gandhara, Ca. 3rd C. Rare 14K Gold Pendant # 2, Gandhara, Ca. 3rd C.